Heat oven to 325. Grease a 10x7 (or something else close enough). In a medium saucepan over high heat, in 1" boiling water, cook broccoli with 1/2 tsp salt. Since you don't want it totally cooked, this should take only a few minutes. In a medium saucepan over medium heat, melt butter. 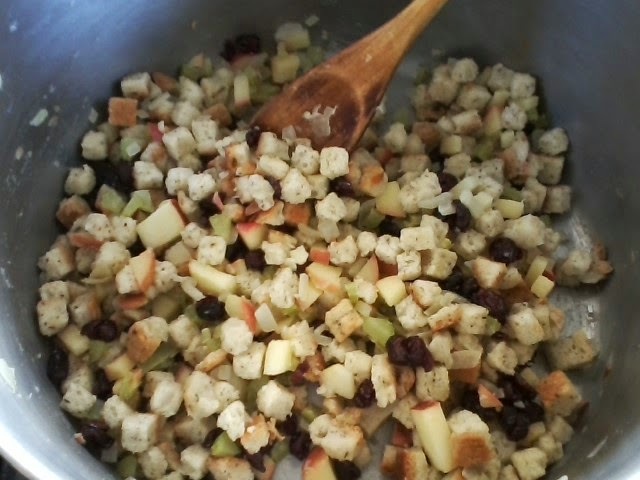 Stir in flour and 1 1/2 tsp salt until smooth. Add onion and cook 1 minute. Slowly stir in milk; cook, stirring constantly, until mixture thickens and begins to boil. Remove from heat. 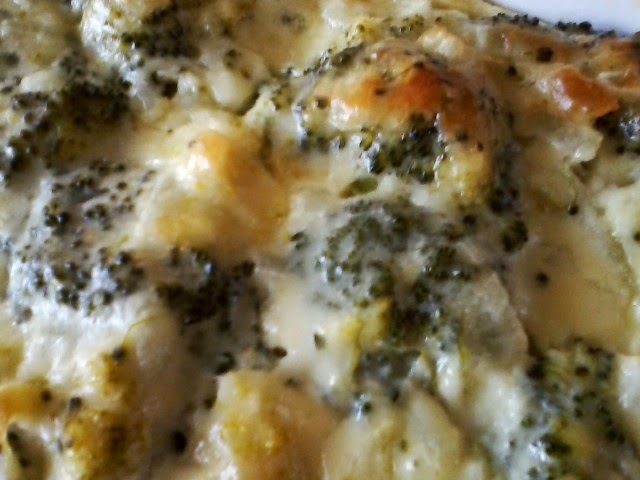 Stir cheese into mixture until it melts, then beaten eggs, then broccoli. 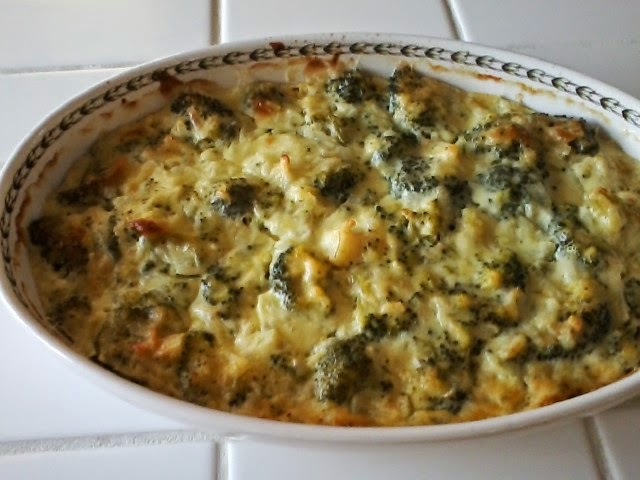 Pour into baking dish and bake 30 minutes or until center is firm to touch and top is slightly browned. Bon appetit! Recipe #106: Puff Pastry Pockets Filled with Chocolate & Cream Cheese...Yum!!! 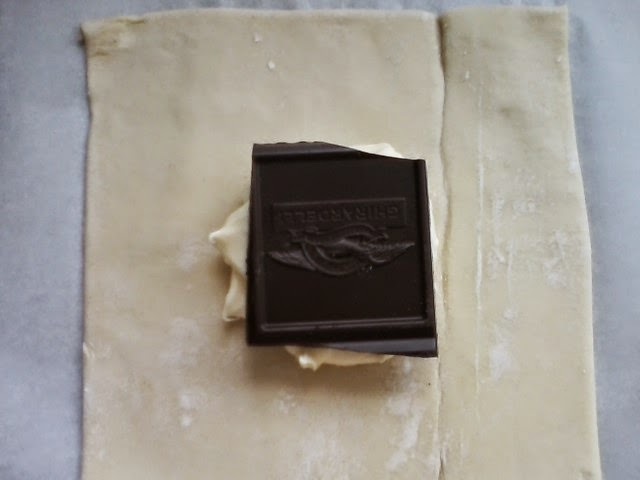 Defrost puff pastry according to the directions on the package. 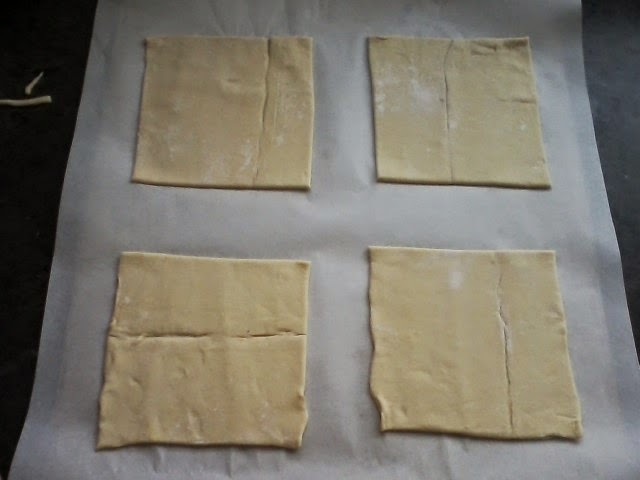 You will be using both sheets of puff pastry and end up with 8 pastries. 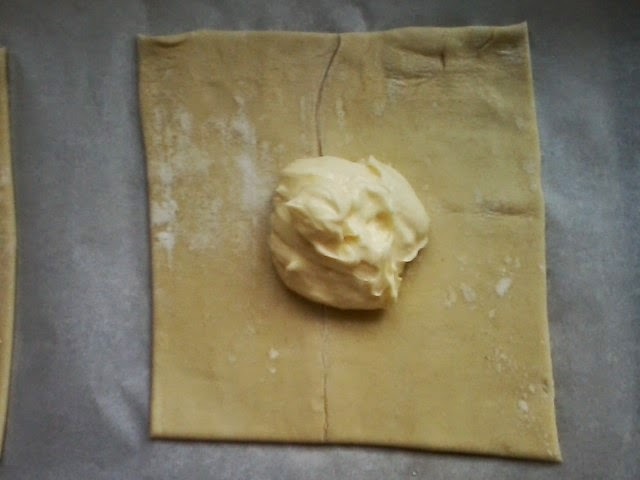 In a medium bowl with a hand mixer, blend together the cream cheese, the egg (not the tbsp of egg) and 1/4 cup sugar. Add the extract if you wish. Set aside. Heat oven to 400. 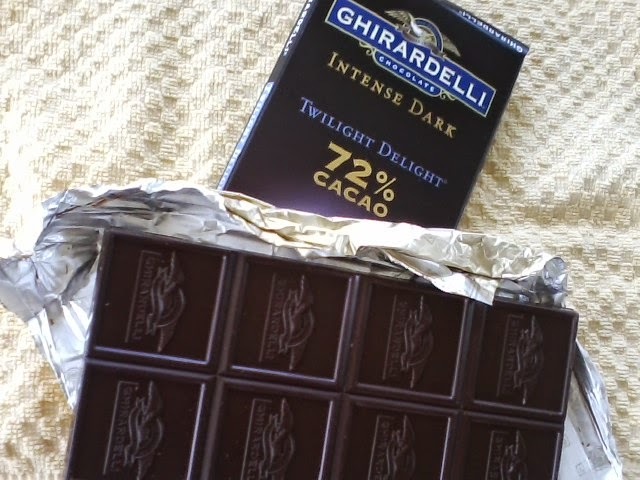 Depending on what chocolate you have, you may be able to break into 8 even squares. Do so now, or break the chocolate as evenly as you can into 8 sections...in the end it won't matter. 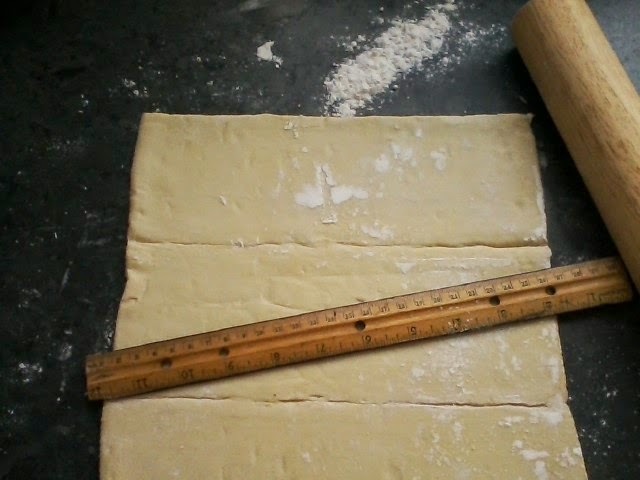 On a lightly floured surface, roll puff pastry until 10"x10"...you shouldn't have to work that hard, as, if my memory serves me correctly, when you unfold the pastry, it will be about 9"x9" already. Cut each piece into 4 squares. 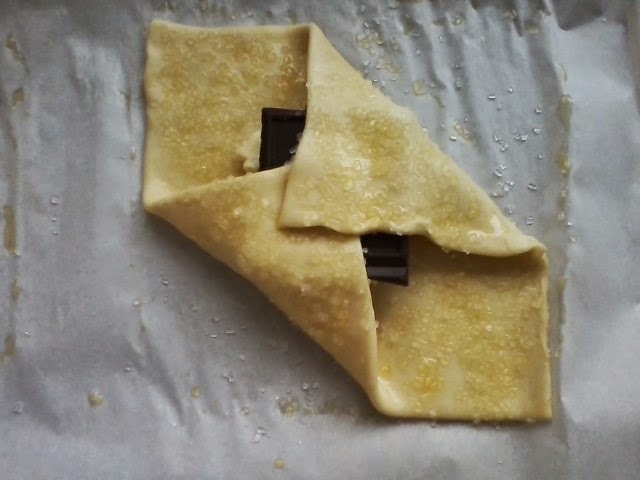 Place each square on a parchment lined baking sheet...you will need 2. Brush around each square with the 1 tbsp reserved egg. 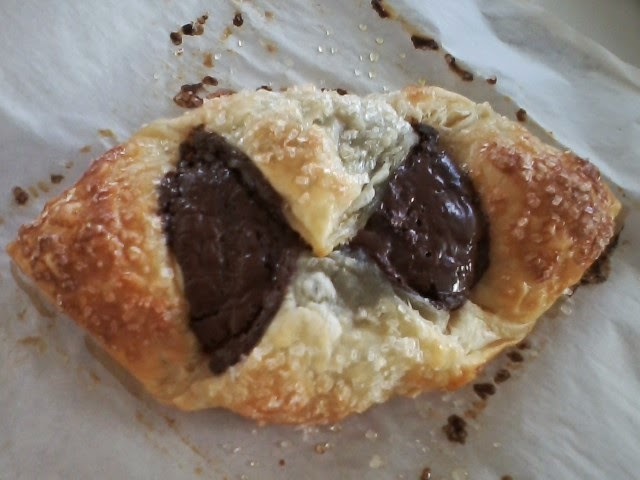 Place a tbsp of the cream cheese mixture in the center of the pastry, then place a square of the chocolate or the broken pieces you put together on top. Fold up the squares as shown below, brushing egg wash on the first two corners you put together, then again when you complete your little packet. 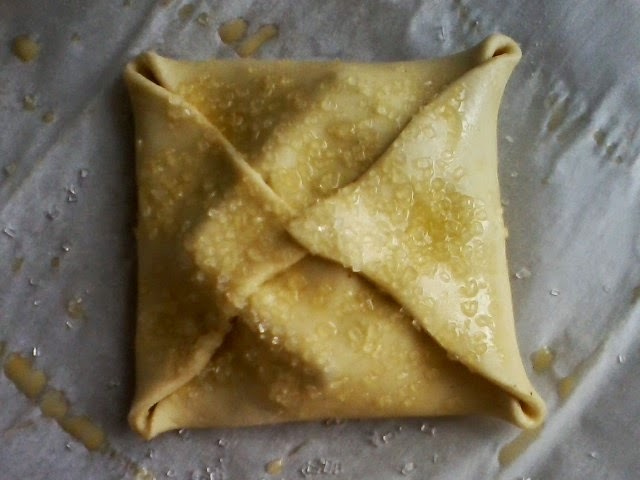 You can also just fold the first two corners and brush them with egg wash, leaving the two ends open. Sprinkle the tops of all with some sanding or regular sugar. 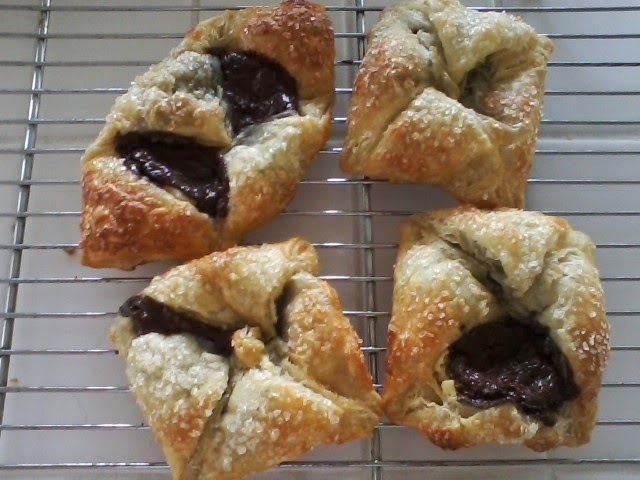 Bake for 15-20 minutes, or until tops are well-browned. You may have some chocolate oozing out of some...that's okay as that sort of makes them look rather rustic. Put on a cooling rack and serve right out of the oven or at room temp. You can also freeze these. When taking out of the freezer, bring to room temp and then put in a low oven for about 10 minutes. Bon appetit! 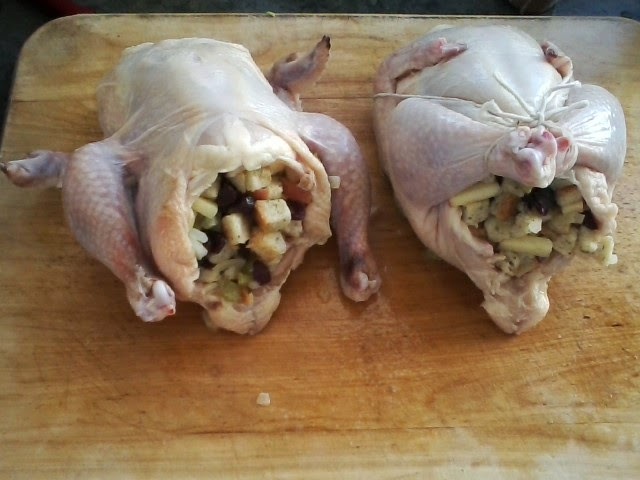 Clean the hens and loosely fill cavities with the stuffing. Truss the hens. 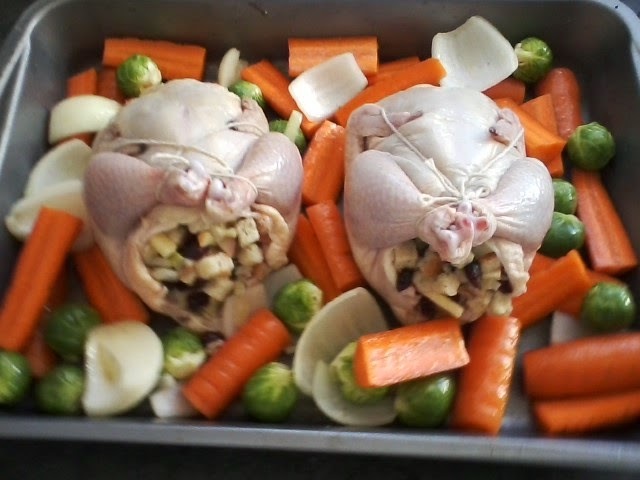 If you have never trussed one, take a long piece of string and put it underneath the back of the hen. 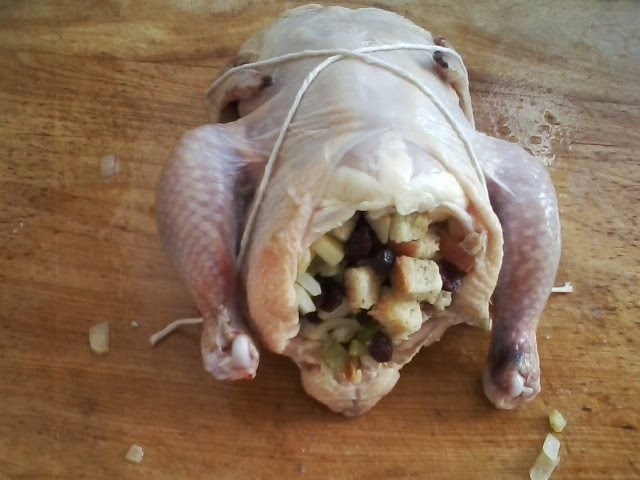 Bring the twine up and criss-cross over the top, then wrap under each leg, pulling the legs together, and tie in a bow. This is shown below. 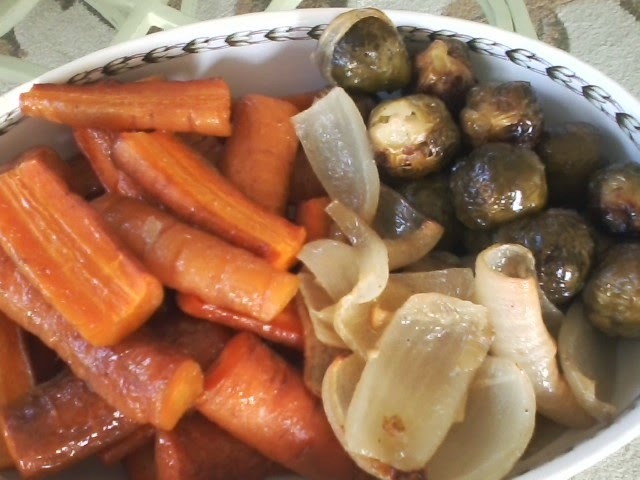 Put your vegetables in a bowl, and toss with 2 tbsp olive oil, salt and pepper. 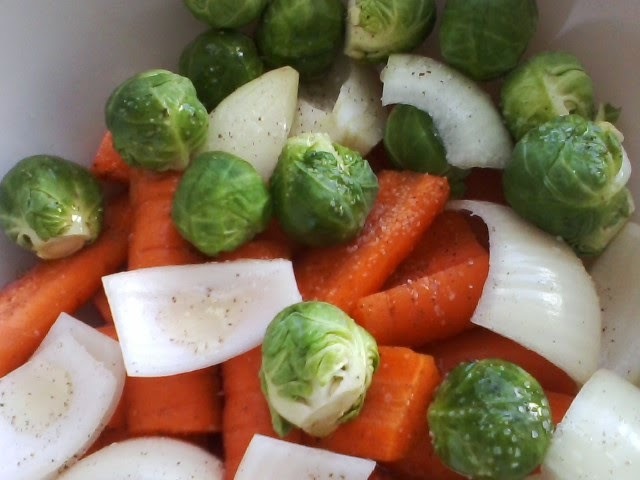 Put the hens in a roasting pan, brush with the remaining olive oil, and spread the vegetables around the hens. 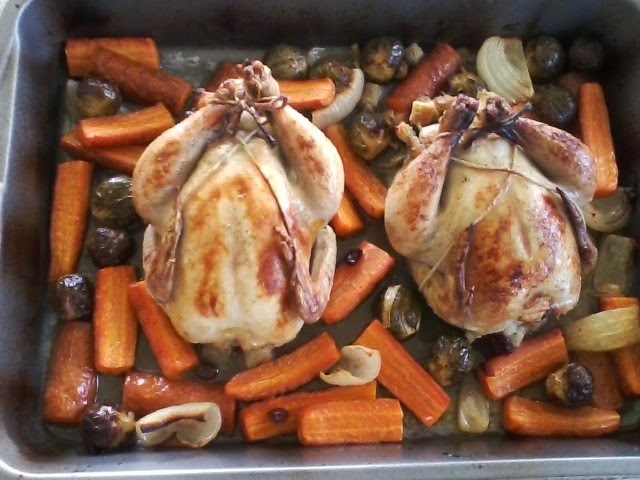 Bake at 400 for about 45 minutes, or until the hens are nicely brown on top. 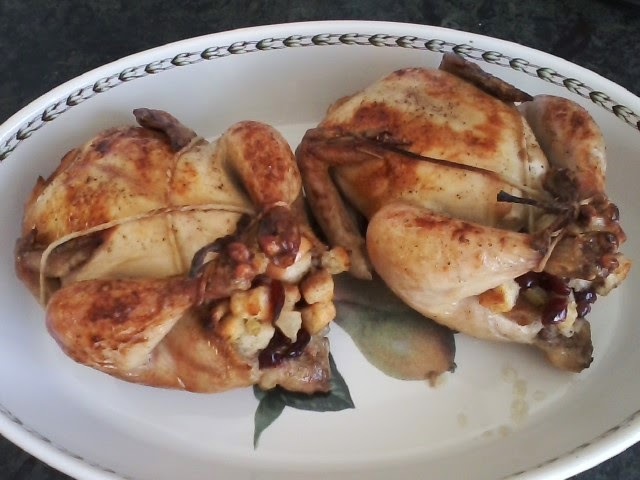 You can also add a mixture of 1/2 cup chicken broth with 1/4 cup white wine and put in roasting pan at the initial roasting. This gives you some juice to put over everything if you wish. Bon appetit! 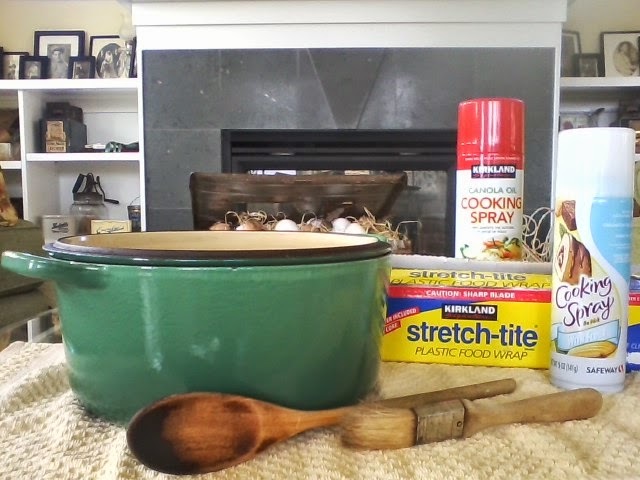 This post is about Le Creuset, Stretchtite, cooking sprays, my wooden spoon and pastry brush. I have two pieces of Le Creuset...a round 5 quart dutch oven and the same in an oval shape. Each piece, nearly 15 years ago, cost about 185.00. I have never used my oval dutch oven, and may never use it. I really liked the look of it when I was purchasing my other piece, and that's what prompted me to buy it. I have used my round time and time again. It really regulates the heat well, and cleanup is a snap. Could I own many other pieces..you bet, but I would never use them. But, I love the two pieces I have. Stretchtite...the greatest invention since sliced bread, if you ask me. This stuff is better than Saran Wrap, Glad Wrap and everything else combined. I buy the two rolls that come two to a pack, not the gigantic role...I would love to, but have no place to store such a large box. This stuff clings like no tomorrow, and honestly, I would walk on broken glass for this stuff. I buy mine at Costco. I think I've been using this product for the past 25 years. I ABSOLUTELY LOVE IT!!! 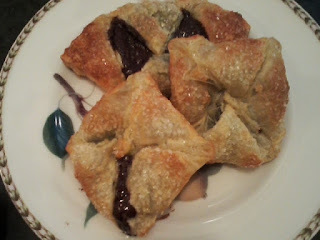 Cooking sprays, both regular and the kind that comes with flour, are always in my pantry. Actually, the regular Pam is always on my counter, as I make my chocolate chip waffle every morning and have to spray the waffle iron every time before I put the batter in. I love the spray with flour, as you combine two steps into one...so no more taking a paper napkin, dipping it in the solid Crisco, rubbing it around the cake pans and then taking out the flour, running that around the pan and banging the pan upside down on the sink. That said, there's something to be said of that routine, and for that reason, every once in awhile, I continue to grease and flour a cake pan the old fashioned way. The cake comes out the same, but there's just something about it that appears different. My wooden spoon I have had probably for 25 years. You can tell how much it's been used, and every once in awhile, I will take a scrubbee to it with soap just to make sure all residuals from past stirrings are gone. I watch cooking shows with people using tongs to turn things...I just can't cotton to that. I like my spoon. It's sturdy and reliable. I have two newer ones sitting in my drawer, but for some reason, I never take them out and use them. Blame it on the depression, even though I was NOWHERE close to being born, but that's the way it is. I love this old wooden spoon. Ah, my pastry brush. Actually I have two...one large, one small. I use them to brush barbecue sauce on ribs and chicken, dust flour off of pastry dough, brush melted butter around different baking vessels, taking specks of things off of baked and cooked goods. They are always on call. 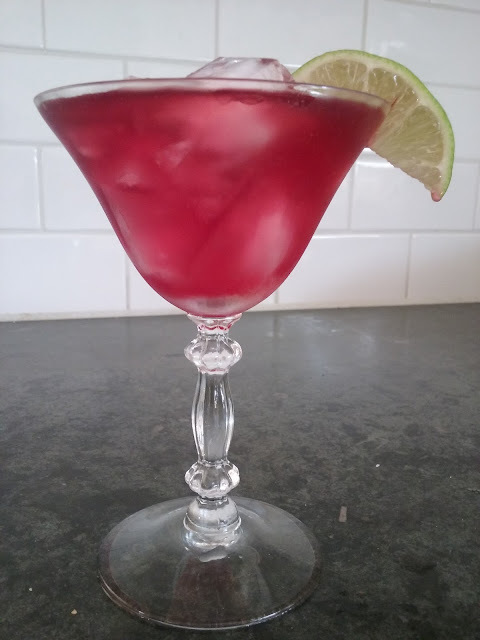 Recipe #104: Happy New Year...Pomegranate Martini? No, Pomegranate Margarita! Boil water in a small sauce water. Turn off heat and add sugar, whisking until sugar is completely dissolved. Cool. I usually want to use right away so put the pan in a bowl of ice water and whisk until cool. Combine all ingredients, except for the simple syrup. 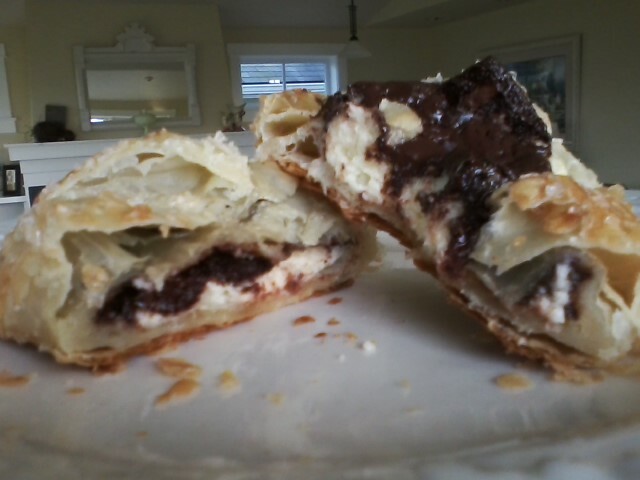 Taste and add syrup or other sugar if too tart for your liking. 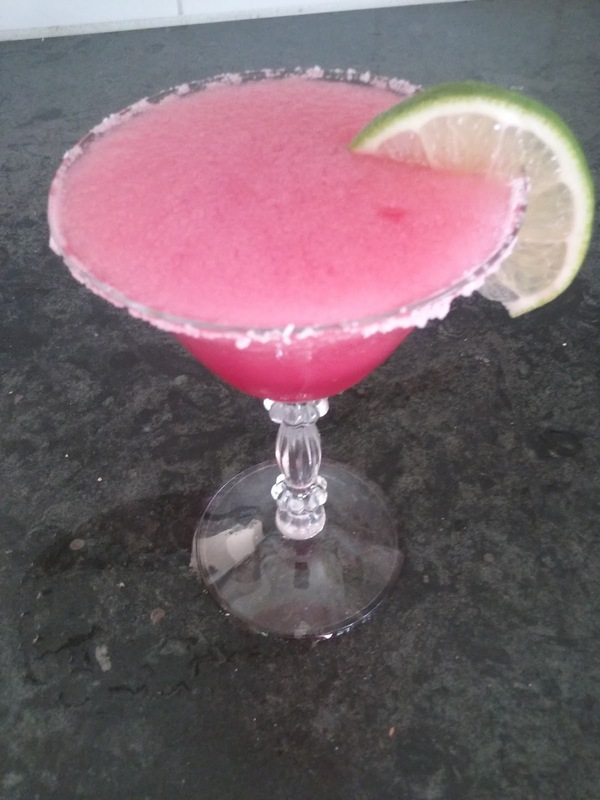 Run a used lime that you used for the juice along the rim of a glass. Dip in kosher salt (I usually put salt in a ring to match the glass perimeter on a plate). At this point, if you want the drink on the rocks, pour into glass filled with ice. 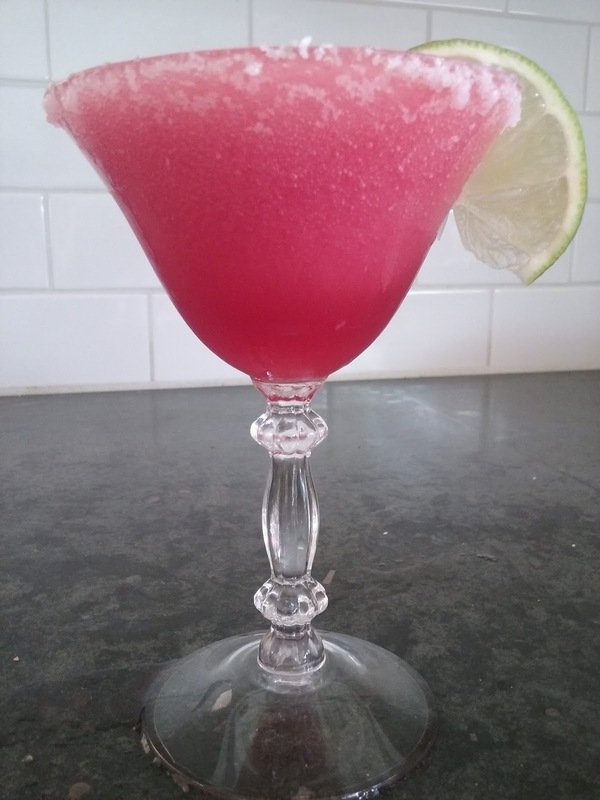 If you want a frozen margarita, put the liquid in a blender and add the cubes. I usually start with only one cup of cubes to see how it turns out. 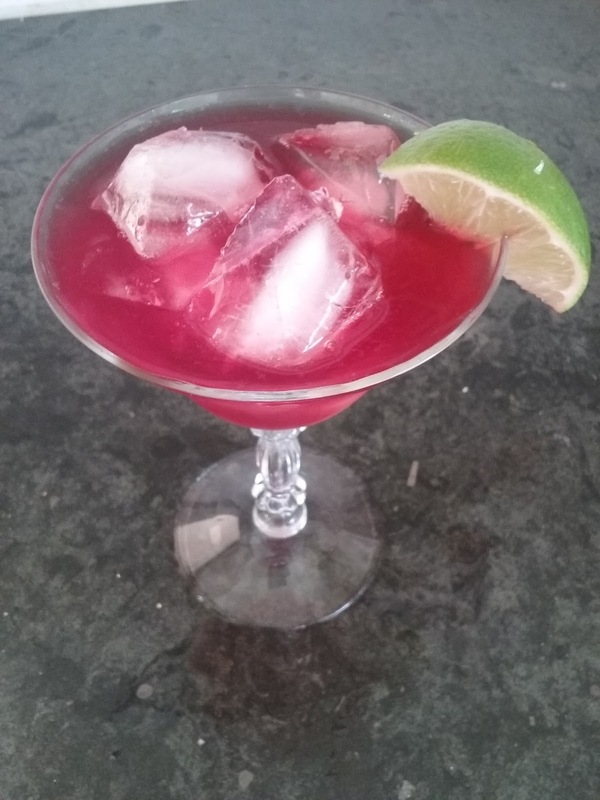 You want the flavor of the drink to come out, not have it watered down with ice. Bon appetit!